In-die fastener installation eliminates secondary operations that add labor costs, diminish quality and restrict throughput. While in-die insertion finds widespread use throughout the metalforming industry primarily for larger fasteners in the M8 to M10 range, a recent atypical application, using microfasteners, illustrates how creativity and custom engineering can allow the process to be scaled down to the most precise of applications. Die-Matic runs the micropin in-die insertion job on a 200-ton Minster mechanical press. 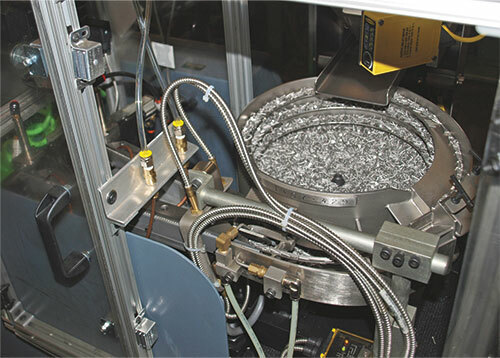 To downsize the standard PennEngineering in-die feed setup, engineer Ashok Patil reduced the size of the system cart (shown) and redesigned the bowl-feed and shuttle setup to singulate and deliver the pins to the die. The feed tube is fixed to the press ram, and runs underneath the light curtain and loops back up to the stripper plate. To minimize cycle time, Die-Matic shortened the tube (to about 15 ft.) and positioned it to, as much as possible, get gravity on its side. The project: Insert two 1.57-mm-dia. by 11-mm-long micropins into a stamped aluminum part running in a progressive die at 35 strokes/min., with tolerances of ±0.2 mm on perpendicularity and 0.3 mm on location. 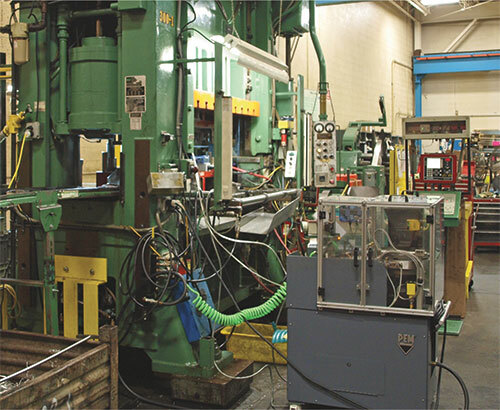 The metalformer that took on this challenging process: Die-Matic Corp., Cleveland, OH, with assistance from in-die installation-system provider PennEngineering, Danboro, PA.
To ensure that parts meet quality specs, the press operator periodically inserts completed parts into an attribute gauge that checks pin perpendicularity and location. A custom system for in-die insertion of micropins allows Die-Matic to eliminate costly and time-consuming secondary operations, but getting there was no small challenge, even for a company with more than a decade of in-die-process experience. “This project took in-die insertion to a new level,” explains Jerry Zeitler, Die-Matic president. Among their other duties related to feed length, part-out and more, sensors work to detect not only prepierced holes that will receive the tiny pins, but also the presence of those pins. In addition, the press operator periodically inserts completed parts into an attribution gauge to verify pin perpendicularity and location. Leading the PennEngineering team on this project was in-die project engineer Ashok Patil, who explains how he was able to retrofit the company’s existing technology and custom-develop and build new tooling suited to the tiny pins. To scale the system down from a standard PennEngineering setup, Patil reduced the size of the cart and redesigned the bowl-feed and shuttle setup that orients and singulates the micropins, and delivers them to the die. Also, an anvil assembly is positioned opposite the injector head on the bottom half of the die. On the down stroke, the micropin depresses the anvil pin; when the ram reaches bottom dead center, the pin is clinched into the workpiece. Patil then describes another significant challenge to designing the micropin feed setup: isolating the vibrating feed bowl from the rest of the circuit. So that only one pin feeds at a time through the 15-ft. line from the cart to the die, the setup features a shuttle that delivers one pin at a time from the bowl to injector-head assembly. Each micropin shoots into the injector head immediately after the retracting punch clears the fastener feed bore in the injector chamber of the head, Patil explains. The pin then enters the nosepiece, which captures and aligns the fastener, staging it for insertion. …always are concerns with any stamping operation, but perhaps more so with this setup. Mahnic explains. The final quality-control step in the process: periodic push-out tests to ensure the strength of each pin-to-stamping connection. “We have to meet a 200-N strength requirement,” Mahnic says. “Initially, the specified diameter of the pre-pierced hole was too large to meet this requirement. We reengineered the hole and gained approval from the customer. Since then it’s been smooth sailing. Wow! Amazing! Thanks for sharing! Wow!, Ashok Patil, Congratulations and wish you achieve many more successes. Phenomenal execution. Way to go Ashok Patil. Example of "Brain & Hardwork on the task"